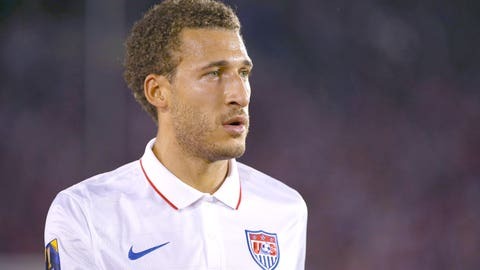 United States fullback Fabian Johnson will miss the friendly against Costa Rica on Tuesday after coach Jurgen Klinsmann sent him home on Monday. United States coach Jurgen Klinsmann on Monday revealed he released fullback Fabian Johnson from national team camp ahead of Tuesday’s friendly against Costa Rica. Johnson asked to come off the field in the waning stages of extra time of the United States’ 3-2 loss to Mexico in Saturday night’s CONCACAF Cup at the Rose Bowl in Pasadena, Calif. Brad Evans replaced Johnson for the final few moments of the match, though the switch did not have any impact on Paul Aguilar’s stunning volley to decide the encounter after 118 minutes. Klinsmann said he discussed the issue with Johnson in the wake of the defeat and opted to remove him from the squad ahead of the friendly at Red Bull Arena. No replacement will be named in the 20-man squad, according to a U.S. Soccer spokesperson. "I had a very severe word with Fabian Johnson and I sent him home today," Klinsmann said during his pre-match news conference. "The situation had occurred there at the end of the game where he said he couldn’t go any more and I reacted to it and obviously made the substitution. He just feared to possibly get an injury, but he was not injured in that moment. He got all stiffened up. It was a muscle issue. It’s normal." Johnson recently returned to full fitness after spending more than a month on the sidelines with a tear in his calf. The 27-year-old defender returned to the Mönchengladbach starting XI for the 4-2 victory over Augsburg on Sept. 23 and played in four matches for the Bundesliga side before featuring against Mexico. The decision to send Johnson — one of the critical players in Klinsmann’s plans going forward — away from the team clouds his potential role ahead of the World Cup qualifiers against St. Vincent & The Grenadines and Trinidad & Tobago next month. Klinsmann said he hoped the decision will prompt Johnson to contemplate his attitude heading into the upcoming qualifiers. "He’s going home after we had the talk," Klinsmann said. "He can rethink a bit his approach towards his team."